Note: While this review will be spoiler free, it will make reference to previous books. If you haven’t started this series yet, check out VBC’s review of book 1, Written in Red. After the Elders swept throughout Namid at the end of Marked in Flesh, crushing the Humans First and Last uprising and literally wiping some places off the map, both humans and Others have been learning the new boundaries that now rule their world. Communication is limited, as is food disruption, with critical links between major cities in Thasia now severed. The residents of the Lakeside Courtyard know it’s more important than ever to show it’s possible for humans and terra indigene to co-exist. But when Lieutenant Montgomery’s brother Jimmy and his family arrive from Toland, that fragile peace may be in danger. Jimmy is manipulative and scheming, always on the look out for easy money, not matter who it hurts. The terra indigene are ready to send him packing before he even gets there, but the Elders are intrigued: what is it about this particular human that upsets the human pack so much? After all, they still want the answer to the chilling question: How much human will we keep? 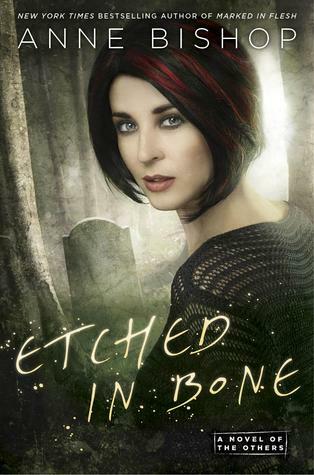 Etched in Bone was a real on-the-other-hand read for me; you know, the ones you come away saying, “I thought this bit was great but on the other hand….” I had a really hard time rating it because on one hand, it’s an Others novel and the standard of these books is redonkulous. But on the other hand (see! ), I had some real issues with this, especially as the final book in the series. The world Anne Bishop has created continues to be an utterly unique blend of urban and high fantasy. It still astounds me, five books in, how she manages to make this world both recognizable and yet at the same time completely alien. There isn’t much in the way of new world building in this installment, but what’s there is already is so rich and complex this didn’t both me at all. That being said, after the epic scale of Marked in Flesh, this book felt very insular. I liked that it almost entirely takes places in the Lakeside Courtyard, meaning we get to spend all the time with the core characters. 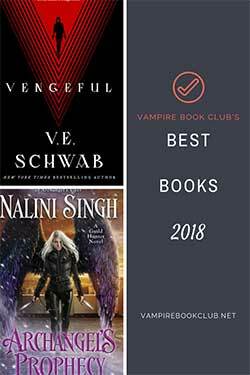 But the pacing felt incredibly slow, with a lot of page time dedicated to politics and food (and not in a mouthwatering Chloe Neill, Jennifer Estep way). I thought Jimmy was a fascinating edition to the courtyard dynamics, particularly the complex feelings he stirs up within his family. He’s a horrid character, showcasing some of the worst human traits to the Others and causes numerous amounts of upset. But from the moment he walked into the Courtyard I knew where the story was headed and it took what felt like forever to get there. I wish Jimmy’s role in this book had been a jumping off point for larger adversaries to come in, as what ended up being the final showdown felt pretty anticlimactic. For those who have, like me, been waiting (not very) patiently for more Simon and Meg, there are plenty of interactions, all of which are, obviously, adorable. I was happy to wait until this final book for them to admit their feelings, it stands true to their characters that it would take a lot of time, but after five books, the romance we do see in Etched in Bone specifically felt a bit ‘too little, too late’ for this reader. So yeah, I came away from Etched in Bone still completely obsessed with this world and these characters, but as a final book to the series it left me feeling underwhelmed. Luckily there is a spin off planned, one that sounds like it has a frontier/western vibe (awesome). You have just ruined my day, I didn’t realise this was the final book in the series , it felt more like the penultimate book. I do have to agree with your assessment, this book was slow and at times tedious compared with others in the series. I like that almost every ‘good’ character in the book got at least a name check but I feel that there is still room for one more book in the series showing in more detail how the Others and the Human pack as just to being a single entity rather than 2 disparate groups thrown together by circumstance. Perhaps a fully inclusive council made up with characters like Elliot, Grandfather Sanguinetti, the Chief and Eve Denbeigh’s husband. Then have humans and Others from Brittania show up to see how it’s done and have the antagonist be an Other in much the same way Jimmy was in this book. I’d rate this book 4.99/5, losing that.01% for a disappointing end to what was otherwise a magnificent series. Great Review! 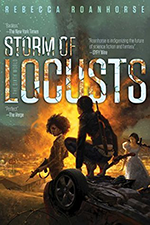 I agree with much of what you say especially the idea that this is the last book of this story arc (for Meg and Simon) and I felt like the ending was a bit, as you say, anticlimactic. But this in no way lessens my love for this series, and I’m really looking forward to seeing where Anne Bishop takes us next in this world.